It's no big deal, literally, but grading rules that applied needless discounts to a tiny fraction of carcasses are no more for most beef. As of Dec. 18, all graded beef in the U.S. can be evaluated for the most youthful "A" maturity category based on dentition as well as traditional skeletal metrics when assigning quality grades. After input from industry stakeholders citing research and economics over the past year, USDA announced the change to modernize grading standards in that way. Quality grading assesses both marbling and maturity. "Nearly all of the large beef processing plants have been using dentition for more than a decade to meet export requirements," said Clint Walenciak, director of packing for the Certified Angus Beef brand. 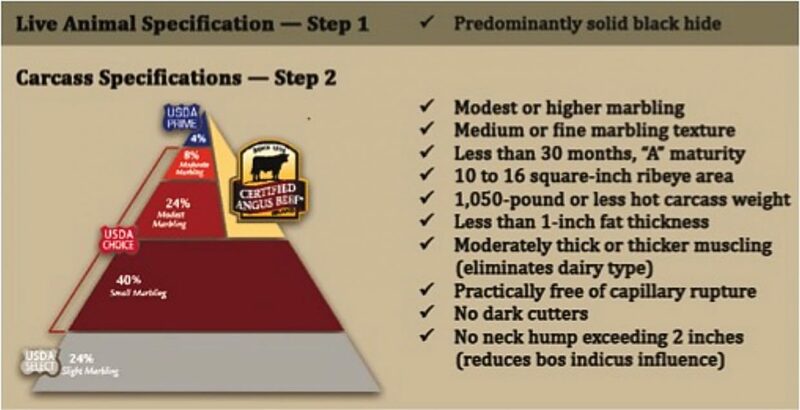 "Roughly 95 percent of all fed cattle are graded to inform consumers on tenderness, juiciness and flavor, and this minor rule adjustment shouldn't affect the number graded." Studies showed beef ruled "A" (under 30 months of age) by dentition but with advanced skeletal maturity (B and C) was just as palatable as beef that did not exhibit such skeletal traits. Under the previous rules, those few carcasses with conflicting traits for maturity were valued at the discounted rate common to older maturity beef. 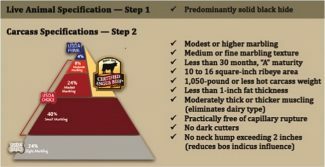 The new standard allows carcasses under 30 months as determined by dentition to be classified as "A" maturity as long as skeletal maturity has not advanced to the oldest categories of "D" or "E." Cattle found to be older than 30 months can still be graded using current standards for lean and skeletal maturity. Branded beef companies that specify maturity may opt for the updated standard by request, and CAB had done so to maintain currency with the greater beef industry. That minor tweak in one of the brand's 10 carcass specifications should have little impact on supply and none on quality and consistency, Walenciak said. "The consistent eating satisfaction associated with our brand is still defined by all of those specifications (see graphic) that trace back through our 40 years of history," he said.